On Friday, April 5, NJIT held the opening ceremony for the first of two internationally recognized peace exhibitions scheduled to be publicly displayed on campus this month, titled, "From a Culture of Violence to a Culture of Peace: Transforming the Human Spirit." The 36-panel exhibition — showcased on the 2nd floor of the university’s Campus Center until April 18 — explores modern and historical issues related to nuclear weapons, and the role that citizen education can play in promoting nuclear disarmament and global peace. 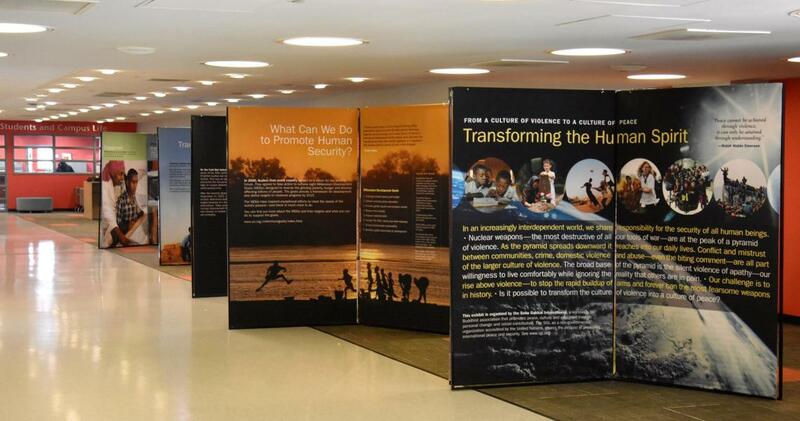 Since 2007, the traveling exhibitions have been curated and displayed before audiences worldwide, making recent appearances at Stanford University, Yale University, as well as events hosted by the United Nations. Both displays arrive at NJIT as part of an ongoing campus-wide dialogue about nuclear arms taking place this month, which will be highlighted at “Steps to a Nuclear Weapons-Free World” — an all-day conference that will bring globally renown experts to NJIT to discuss the multifaceted topic of nuclear war and disarmament. “Steps to Nuclear Weapons-Free World” will be held on April 14 from 9 a.m.-5 p.m. at NJIT’s Campus Center Atrium. For more information about “Steps to a Nuclear Weapons-Free World,” including event registration and full list of distinguished event speakers, visit http://www.njit.edu/nuclearfree/ or contact nuclearfree@njit.edu.